Because they are a hospitality client, and a wonderful, top end, romantic getaway they share so many attributes to anyone in the hotel and accommodation space on front page of search these days. Organically, this story is well repeated in many places. Paid Search, it is systemic to the vertical. Let me explain. Organically, unless the owner or staff of the accommodation property can go out and about and take a photo of guests, or the countryside or the weather and write a good post about the local action, its bloody hard to grow the amount of content on their accommodation website. Content is King organically. 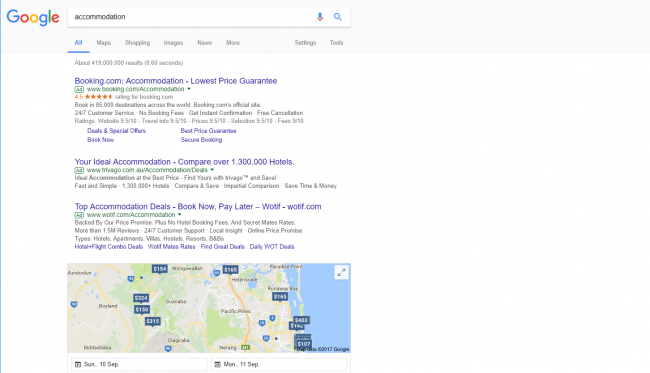 Second, organically, we see the growth of paid leaches, those large booking sites that charge small properties and large properties commission on bookings that they get from paid ads. Thirdly, we see the reduction of organic listings because of 4 listings that are paid at the top of search, and also the explosion of mobile search, and the lack of below the fold action we see these days with up to and over 50% of search on a mobile phones. Then you have the war on Google’s well placed local business listings (maps /; my business / places) as it has morphed from and to. The game has become very serious in accommodation. Organic used to be the Holy Grail, now its a large self funded burden, that many cannot do themselves, and outsourced companies cannot do well without local assistance. Adwords? It’s Budget Wars and it comes down to brand protection and minimising the bleed of bookings from the big players. It can still be done, but imagine telling clients what and why its changed. Its a War, but without the bullets… You can still succeed and grow, but you need to partner up and be smarter. That’s where Website Essentials comes into the picture!